The rapper released not one, but two mixtapes on his website for Christmas—for free. 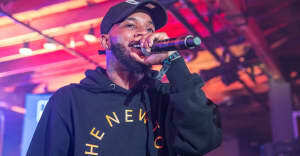 Canadian rapper Tory Lanez decided that dropping one mixtape on Christmas just wasn't good enough. Instead, Lanez decided to release two: The New Toronto and Chixtape 3. Chixtape 3 is the third effort in an installment going all the way back to 2011. The last Chixtape was released in 2014. Both The New Tortono and Chixtape 3 were released earlier today for download on Lanez's website.